Last Thursday I was woken up very early and I wasn’t exactly sure the reason for it, everyone was already up – Mama, Daddy, Nan and G Dad. They had all these bags packed and we quickly piled into taxi’s. I thought perhaps we were going on a holiday but I didn’t remember Mummy packing my clothes into my Trunki. They also kept talking about a place called Abu Dhabi, which sounded like a magical word I had heard Mummy use before ‘Abracadaddidoo….’ some thing like that. As soon as I heard the planes above me I knew we were going to that Heathrow place, but I wasn’t convinced that it was us that was going on a holiday and Mummy hadn’t mentioned anyone else coming to visit, so I put my good detective skills to use and concluded only one more possible outcome, which I wasn’t too happy about…. It was time for Nan and Gdad to go home. This made me sad to think that this was the reason we were going to Heathrow airport, usually it’s a happy place, we are either going away on a new adventure, coming home or picking some one up but I had never had to say ‘goodbye’ to anyone yet. We had one last coffee and croissant with them and I jumped all over Nan for last minute cuddles. Mummy took a few pictures and then after a little while it was time to say our farewells. I could see that Mummy and especially daddy were as sad as I was, to say goodbye. I had the most fun with Nan and Gdad, every morning I would wake up and instead of yelling out to Mama I would yell ‘Nan, Nan, Nan’ or ‘Granddad, granddad, granddad’. On a few occasions I would wake up early, daddy would get me up when he was getting ready for work and whilst he was in the bathroom I would sneak into Nan and Granddad’s room and wake them with a big ‘Nan!’. I am one very lucky girl though, as sad as it to say goodbye I am grateful that I got to spend lots of time with Nan and Gdad, I am so glad they came over to visit because I was so small last time I saw them. This time got to make some proper memories and they taught me all sorts of useful things. Nan read me lots of stories and helped mama teach me numbers and the alphabet. She also taught me a piggy song with my toes, my favourite part is when she says ‘wee wee wee all the way home!’ Granddad had this fun horsey game on his legs and would watch lots of horses on the TV, although he called them something different – Gigi’s. He also taught me the most clever thing ever, how to use the ipad – now I can quickly navigate through all mummy’s boring things and find the good stuff, the apps especially for me! We squeezed in a few more fun adventures in the city with Nan and Gdad before they left. The other week we had a great day out with Mama, Daddy, Nan and Gdad in Hyde Park. We went for lunch in the Serpentine restaurant which overlooks the lake and they make delicious Pizza’s. I had a little bit of a walk around the lake but the most fun part was when daddy showed me how to feed the giant ducks! I had filled up on chips and pizza for lunch so I had plenty of spare rice crackers to share with the ducks and they were very grateful for it, they were so hungry they ate out of my hands! To be honest I was a little nervous at first but once they took it the first time I wanted to feed them anything Mama had packed in my lunchbox. We then walked all the way from Hyde park to South Kensington because Mama told Nan to about the best cupcakes in London – Hummingbird. Needless to say everyone was very impressed with how good they tasted. Another Sunday I had a shopping day in the city with Daddy, Nan and Gdad. This time Mama didn’t join us as she went on a sushi making course with Kristy and Julien. I didn’t really know what sushi was until she let me try some of her creations the next day. It was delicious, and I think I surprised Mama that I liked it so much. I even impressed Nan and Gdad as they weren’t that keen to try but when they saw me eating it they had a little taste too. I have to admit it does look kinda of strange but it’s mostly just rice. Finally another thing we did before Nan and Gdad were homeward bound was meet up with Uncle Albert, Brenda and Nan’s cousin Daphne and her husband George. We went to a nice italian restaurant in Covent Garden and daddy took some time off work to join us, which is a rare occasion. I slept through most of the lunch but I had a little mingle towards to the end. It was nice to meet more of Nan’s family and see Uncle Albert and Brenda again. 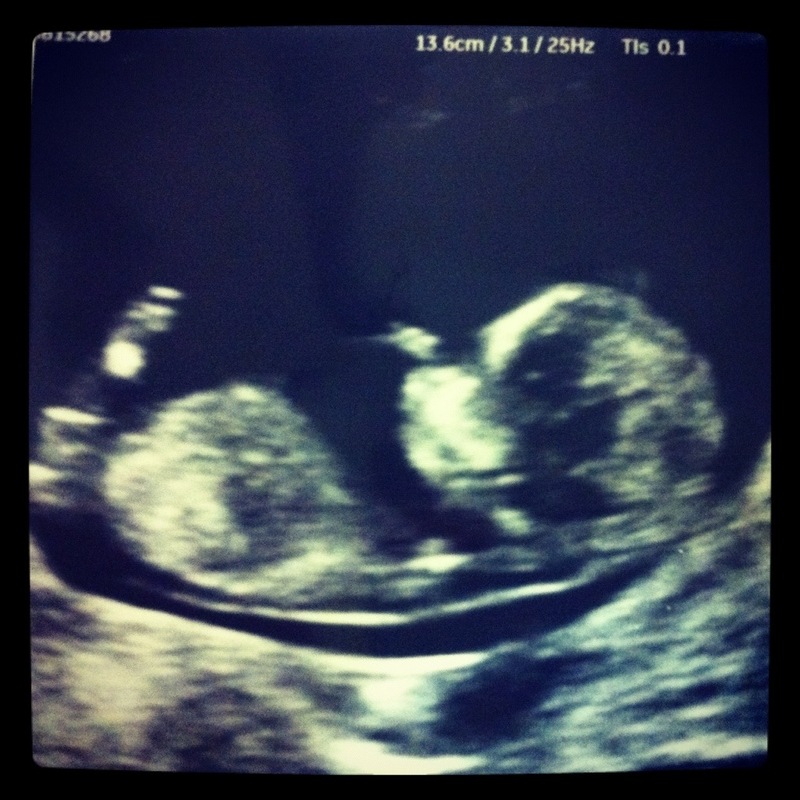 I am very impressed that you all figured out our special news. Mama and I have had that little trick up our sleeves for weeks and couldn’t wait to post that picture. 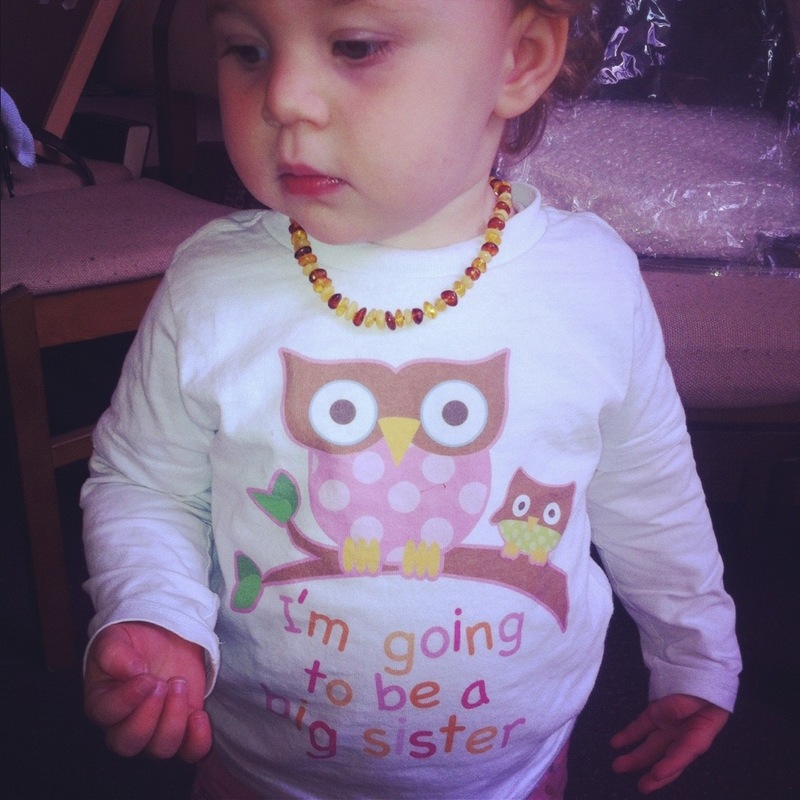 I am so excited to be a big sister and can’t wait to find out what we are having. 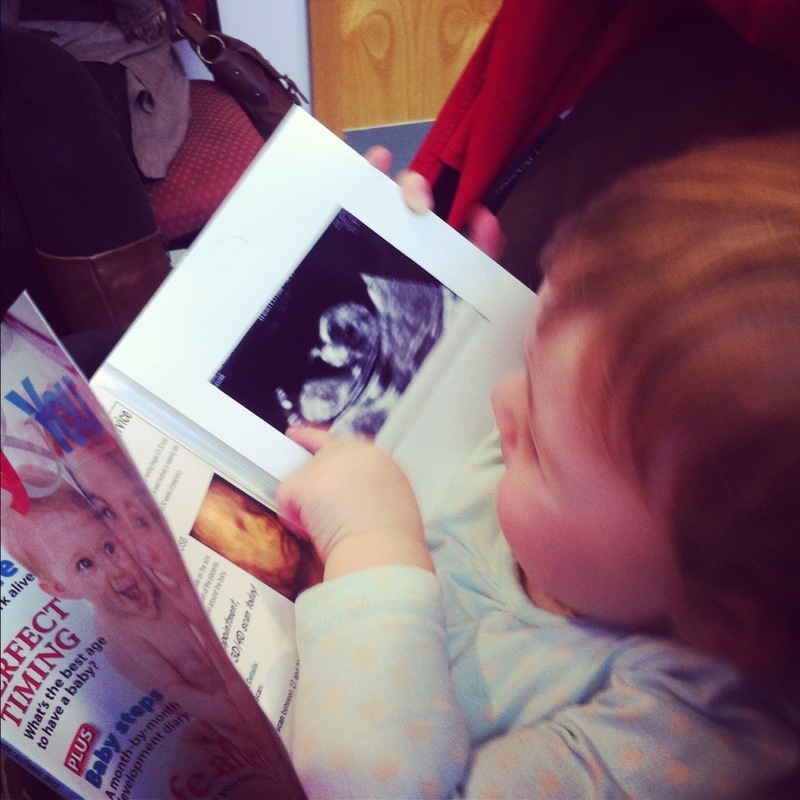 Yesterday G Nan, Mama and I went to the hospital to get a sneak preview of him/her. It was so cool to see the bubba chilling out in Mama’s belly sucking its thumb. Mama is only 12 weeks so we still have a long wait to go.